The Colbert Report recently had on the show Fr. James Martin, SJ, chaplain of the Colbert Nation. He spoke about the role of humor in Christianity, which he outlines in his book, Between Heaven and Mirth. Sounds like a good read. Interesting that Elizabeth Duffy just wrote a column about the never-ending pleasure-chase our society is hellbent on pursuing, yet the chase puts us in lands far away from laughter and joy. Thursday’s episode of The Office was grand! I love the show. It’s the only one I watch every week. Throughout the episode, the new CEO of the Dunder Mifflin slyly goes around, learning one by one what each person in the office is ultimately afraid of. Then, at the end of the show, he brilliantly crafts a story that spooks everyone in the office–for a different reason. Perhaps this is why there is so much fear language in the Bible, even in the NT. It is, after all, a “fearful thing to be in the hands of God”. And that’s the kind of fear we’d do well to celebrate more than once a year. To be honest, sometimes I fear that we’ve gone down a very dangerous path in reducing so greatly the word “fear” from our Christian vocabularies. Over the weekend we went to Boys Town, just a short bit away from here. There we had Mass, ate, took a tour and met with the Serra Club of Omaha. The work of Boys town continues today. About 6000 students or so someone told me, and nowadays they live with host families nearby. I’ve been thinking so much about virtues lately, ever since my master’s thesis. The simple definition of virtue is a habit directed to the good that become part of one’s character through practice. Fr. 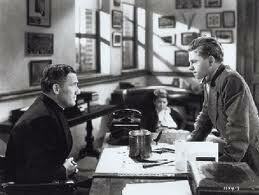 Flanagan seemed to be most interested in forming virtuous characters of the troubled boys of society. Thus, Boys Town was born. And home is where the virtues are learned. In order to become part of a person, the virtues must be part of the environment and lived out in the example of others. And they must be taught and their practice must be part of everyday life. Faithful practice will plant a virtue into the very core of one’s being. Fr. Flanagan and the story of Boys Town testify to the reality that this is true! His example and the environment he made out of Boys Town did incredible things for the boys under his charge. The movie does a nice job portraying the story. Today, another class is graduating. Another group is leaving Boys Town and going into manhood. It is not an easy world they are going into. The coddled, the weak and the doubting will fall, but the men will survive, and great will be the honor they shall win. You graduates must be such men–men of Boys Town. You must realize that the inheritance of your generation is toil, sweat, and sorrow. But you must also know that out of the bitterest battle, the sweetest victory is won. I envy you, the glory of solving the problems you will meet, for the tasks of youth today are tasks for giants. But the time that awaits you is the time when giants will walk again in the land. Be staunch, keep the faith, and you will walk among the giants. Yesterday evening I watched Of Gods and Men, a film that very recently came out on DVD. 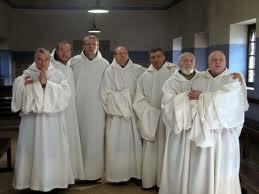 The storyline has to do with a group of Trappist monks in Algeria, 7 of whom were killed in 1996 by Islamic extremists. The Algerian officers want the monks gone because they see their monastery as a dangerous threat to their way of life, a dangerous “remnant”. Already we see a critical theme in the ways in which the nature of Christianity is perceived versus its true nature, lived out daily in little and local ways. We see this true nature in the rule of charity that is lived out in the amongst the brothers but also within the local community. We witness the service of the Trappist group to the Muslims nearby, who develop a close relationship with the monks. Those who interact with the brothers know them to be good, generous, and holy men who are not interested in causing anyone harm. Yet, the Algerian government, from a distance, perceives the community differently. They want the monks gone. And violence ensues. Are things so different today? Society sees us Catholics as promoters of repression, dangerous tradition, oppressive values–all the while we know that within our faith is the only way to true and lasting freedom, a freedom to which we invite others to share. Yet society wants to kill us. They want us gone. You needn’t look far for evidence of this kind of thing. The question the monks are concerned with through the film is this: should we stay or should we go? They decide to stay, realizing that a shepherd never leaves his sheep (the townspeople in this case), that they were called to serve here, that they have no where else to go except the place God put them, and that they cannot run away from service. I can’t think of a film in recent memory that so truly and respectfully portrays the life of faith, the religious life, and most especially the value, use and meaning of liturgical prayer and the sacramental, Holy Mass — how these enhance the life of faith, deepens its roots so that it may withstand the storms that come. It’s a beautiful connection Scalia examines here. Liturgical prayer, and in particular the Mass, is the most important thing in the world. It’s what connects us to the choirs of heaven. It’s the only way to salvation. And, not to forget, it also enhances our lives here. It grants us peace in the midst of the worst turmoil. A scene I found almost unspeakably beautiful involved Vespers. Knowing that at any moment their humble monastery may be invaded by murderous extremists, the brothers hear a chopper come near. Perhaps this is the moment of their martyrdom, and while they by no means seek death, they cannot be anything but who and what they are: monks. As per the Rule of St. Benedict (which Trappists follow) “nothing is to be preferred to the Divine Office,” and so they draw together in their very humble choir, facing the stained glass window outside of which the menacing chopper hovers, and they put their arms about each other’s shoulders — true brothers — and sing all the louder, in beautiful harmony, in defiance, and in joy. The “last supper” scene truly is astonishing. A confrontation with mystery. Understanding that this may be their last meal together — that they have made an irrevocable decision that will likely mean their deaths — they fill their glasses with the best wine, and instead of a reading, they listen to Tchaikovsky’s Swan Lake. As the music plays, they share a wordless conversation about love. Here is Love; they are confronting its depths and it sacrifice, it’s ache and confusion and its powerful relation to Truth. The Gospel notes are there: that they have saved the best wine for last speaks to the beginning of Christ’s ministry, and Mary’s words, “do whatever he tells you,” a scene which launched the world’s exposure to Jesus of Nazareth and speaks to the truth that to know him and follow him involves continual rediscoveries that hone new depths. We see that all of their pursuit of Christ has brought them to this self-knowing surrender to Providence. Should it ever befall me, and it could happen today, to be a victim of the terrorism swallowing up all foreigners here, I would like my community, my church, my family, to remember that my life was given to God and to his country. That the Unique Master of all life was no stranger to this brutal departure. And that my death is the same as so many other violent ones, consigned to the apathy of oblivion. I’ve lived enough to know, I am complicit in the evil that, alas, prevails over the world and the evil that will smite me blindly. I could never desire such a death. I could never feel gladdened that these people I love be accused randomly of my murder. I know the contempt felt for the people here, indiscriminately. And I know how Islam is distorted by a certain Islamism. This country, and Islam, for me are something different. They’re a body and a soul. My death, of course, will quickly vindicate those who call me naïve or idealistic, but they must know that I will be freed of a burning curiosity and, God willing, will immerse my gaze in the Father’s and contemplate with him his children of Islam as he sees them. This thank you which encompasses my entire life includes you, of course, friends of yesterday and today, and you too, friend of last minute, who knew not what you were doing. Yes, to you as well I address this thank you and this farewell which you envisaged. May we meet again, happy thieves in Paradise, if it pleases God the Father of us both. Amen. Insha’Allah. The unasked question: Why is there so much life? So much joy? Over the weekend, I saw the movie The Tree of Life. It’s an impressionistic story that takes place mostly in the 1950s in the midwest. It was very impressionistic. One of those movies so laden with meaning and imagery and metaphor, that one must watch it many times over to understand what’s going on and the significance of various parts. The movie seeks to address the question of suffering and death. The question is the age-old question that Job asked thousands of years ago: why is there so much suffering? why is there so much death? We hear these questions all the time. Strange that we accept life and joy without thinking about it, but when the bad happens, we can’t escape the question, WHY? Perhaps we feel entitled to a life without sacrifice, given that our modern world teaches us to escape the cross. I don’t know. But the movie asks the opposite–and, strangely, often unasked–question, too: why is there so much joy? why is there so much life? In the movie, we are taken into the home of Mr. and Mrs. O’Brien and back to the childhood of their three boys. We witness their development over the years, and the innocence and joy of childhood are depicted beautifully. 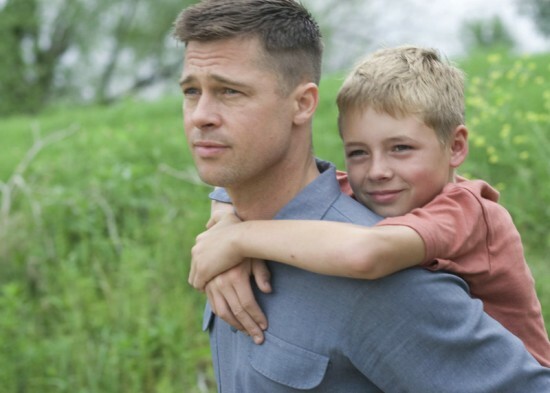 What the movie captures so nicely, I think, is that one of the many great things about childhood is the curiosity characteristic of that age, and the reality that kids can’t help but see beauty and joy that is, in fact, very present int he world. The film shows that sad reality that, as we grow, our ability to immediately see the grandeur in things lessens. Vision blurs, especially in the modern world that we see one of the boys, Jack, now a grown man, living in at the end. He is lost, unable to even see the good. Except that at the very end he does. And Jack is then able to move on with his life, finally having come to terms with the loss of his brother, whose death is never explained. Perhaps the theme of this movie is that often bad things happen, and that things do go wrong, but in the end, love and life win. The father, a patriarch who is almost abusive at times, has a sincere love for his boys–a love that he is not afraid to show. Yet, he also shows an attitude of selfishness in teaching his boys that to succeed in life is to fight for yourself no matter the cost. In the end, though, the father’s love dominates his selfishness. Love wins. Life wins. Joy wins. And so, the answer to the unasked questions, Why is there so much life? So much joy?, is this: there is so much life and joy because life, joy, and love always win in the end. Death and suffering lose. One need only shut oneself in a closet and begin to think of the fact of one’s being there, of one’s queer bodily shape in the darkness (a thing to make children scream at, as Stevenson says), of one’s fantastic character and all, to have the wonder steal over the detail as much as over the general fact of being, and to see that it is only familiarity that blunts it. Not only that anything should be, but that this very thing should be, is mysterious! Philosophy stares, but brings no reasoned solution, for from nothing to being there is no logical bridge. All is mystery, permeated by grace. And what a beautiful mystery it is. There’s a good reflection on this movie at The Broken Splice Blog. There are also a few nice entries over at In a Spacious Place. The USCCB has a bit to say about it, claiming it’s a spiritual movie but not a religious one, that in the end the director’s agnosticism “wins out.” Maybe I need to see it again to get that idea, because there’s a very powerful scene in a Catholic church–and the homily delivered is exceptional! A moving part is when the father is kneeling. It’s worth a watch in my opinion. Recently I watched the movie “Doubt”. I enjoyed it, though I hear that it was not so true to the play it is based off of, even though the author of that play adapted it for the screen. The movie of course came out not too long ago and centers on the abuse crisis. Sr. Aloysius, the school principal, is convinced that Fr. Flynn was guilty of inappropriate conduct with a student. The movie reveals well, however, that Sr. Aloysius wanted him to be guilty from the get go. As Sr. James, a young nun who teaches at the school (and a character based on the author’s first grade teacher), points out, she didn’t like that he liked sugar in his coffee or that he used a ballpoint pin–petty things like that. I wonder if we can’t say the same thing today. So many people want priests to be guilty of this kind of crap. Why? Because of some other reason. They simply want them to be guilty of something that will bring about their demise. That said, Fr. Flynn does seem to have checkered past that we never know the details of. If nothing else, the movie provides an interesting look into the life of the Church around the time of Vatican II. It especially provides a wonderful glimpse into religious life at the time.